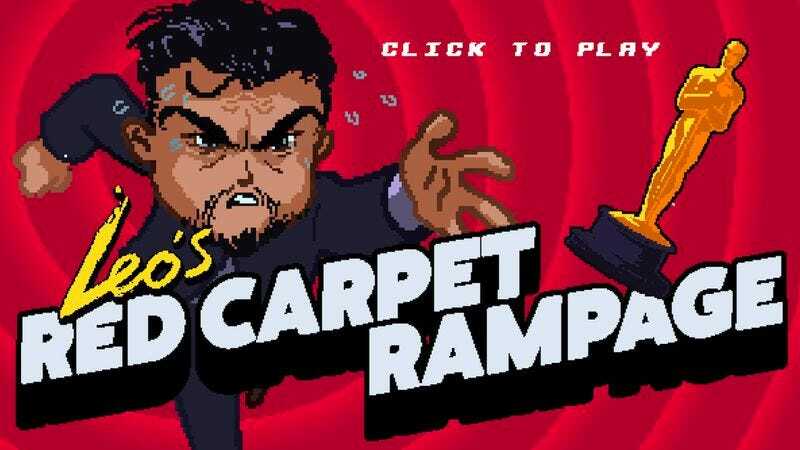 We all know that Leonardo DiCaprio’s lack of an Oscar has become something of a played out joke by now, but there’s a new online flash game called Leo’s Red Carpet Rampage that puts a refreshing and finger-destroying spin on the award-less tragedy. This isn’t just another hastily thrown together flash game quickly and cheaply made to capitalize on the meme du jour: Red Carpet Rampage is actually a very fun game, although it might not be so fun for those who get frustrated at impossible games. The game is a WarioWare-like series of quick-hitting trials that goes back and forth between racing actors like Eddie Redmayne (in The Danish Girl) and Michael Fassbender (in Steve Jobs) down the red carpet in pursuit of a floating Oscar trophy, and challenges like “ACT HARDER” and “QUAALUDE OVERDOSE,” all of which are played using the G, H, and Space keys, or the mouse. You can try the game for yourself here, but beware that its futility is likely a humorous (and well-executed) commentary of DiCaprio’s enduring struggle.